Love to travel? Help inspire Girl Scouts! Help inspire girls to travel by volunteering with the Travel Club. This group is designed for girls in grades 4-11 to explore topics related to travel and to plan a trip of their own. 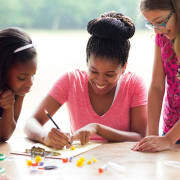 As a Travel Club Volunteer, you will work with one of the cohorts of girls to help them plan, budget, and go on an adventure. You will assist with executing meetings, some administrative tasks, and making sure the plans stay within policies and procedures. Must be willing to work with girls of all ages. This cohort is planning a regional trip to take over the summer. If interested, this would be additional hours over the weekend. This volunteer opportunity is for approximately 10-14 hours (including training/orientation) over the course of the semester/summer plus any additional time you may travel with the group. The group meets on Thursday nights once a month. Approximately 3-4 hours/month for a total of 10-14 hours over the semester. Volunteers would need to become Girl Scout volunteers to cover the cost of insurance and background check.